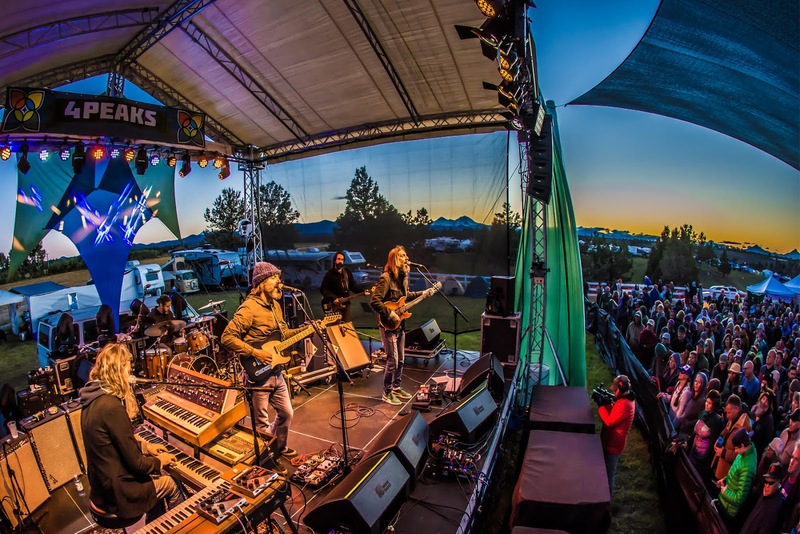 4 Peaks Music Festival will return to the gorgeous high desert mountain peaks of Bend, Oregon on June 15 for its tenth anniversary, celebrating in style with an expanded lineup and new location. East coast jammers moe., Railroad Earth, and The Infamous Stringdusters top the lineup while west coast mainstays like Karl Denson’s Tiny Universe and Poor Man’s Whiskey combine with a bevy of homegrown talent to round out the festival's biggest lineup yet. The lineup isn’t all that’s growing. Moving to Stevenson Ranch presented the festival with much needed room for growth that was taken advantage of with the addition of “The Junction,” a large grass area in the campgrounds next to the Furthur Bus that will be dedicated to non-stop late night music all weekend long. For those with children, don’t worry, the family-friendly vibe that 4 Peaks was built upon still remains a priority and can be appreciated quietly in its entirety from the family camping area at night or the newly expanded “Kidlandia” during the day. Local acts constitute the diverse lineup on Thursday night until Friday takes off in a decidedly “grassy” direction with Far Out West, Warren G Hardings, and Coral Creek beginning the day. The Infamous Stringdusters and Railroad Earth close out the main stage before long-time host band Poor Man’s Whiskey’s late night in the tent ends the amplified music for the night and “The Junction” pickin’ begins. Saturday takes its own direction as well, opting for the jams over strings, but not until mandolin prodigy-turned-virtuoso Sierra Hull’s early afternoon set is over. Psychedelic roots-rockers Moonalice kick start the jamming in the tent before Karl Denson’s Tiny Universe takes over the main stage, followed by another set from Poor Man’s Whiskey, and then of course, moe. Dan Lebowitz of ALO has put together a “Summer of Love Super Jam” for Saturday’s late night featuring songs from 1967 and an all-star collection of musicians. Sunday, as usual at 4 Peaks, will make for a mellow and relaxing end to the weekend. Beginning after early morning yoga, The Pitchfork Revolution will be pickin’ “tweener” sets all day long between main stage acts including Ashleigh Flynn and local jam-rockers Watkins Glen. 4 Peaks is offering a variety of flexible ticket options that range from the now $200 four-day pass all the way down to the $20 Sunday-only ticket. The festival also offers what essentially pans out to two ($110) and three-day passes ($145) as well, leaving little excuse to miss out on this one. And as always, both camping and admission for children under ten are free.